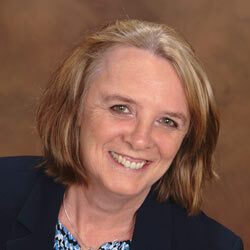 My name is Erika Slater, CH and I provide the hypnotherapy services for Free At Last Hypnosis. I work with people who are totally ready for change of habits and direction in their life. I give them the tools to have more control while getting them to understand how amazing and powerful their mind is as a resource to effect change in their life. 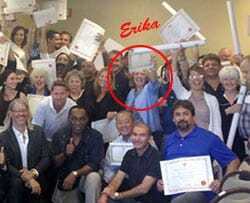 I received my training and certification in hypnosis from the National Guild of Hypnotists, which is the largest hypnosis organization in the world. I have also studied with Igor Ledochowski through his Hypnosis Training Academy. I conduct my services under the National Guild of Hypnotists strict code of ethics and conduct, which means you can expect my commitment and best effort to achieve a satisfactory result for you. I’ve published articles on quit smoking and weight loss and written eBooks about smoking cessation, hypnosis and NLP. I continue to be a student of hypnotherapy and have an ongoing investment in current techniques and advances in the field of hypnotherapy for the benefit of my clients. A recent investment took me to California where I attended a Igor Ledochowski intensive workshop. Here is me along with other dedicated professionals receiving our final graduation certificates. I am a full time professional hypnotist and have been in private hypnotherapy since 2004. I operate my hypnosis programs out of my office in Mashpee MA for those who want an in-office experience. Many of my programs are offered online as well as more and more people want to take advantage of a travel-free experience and it also accommodates clients outside Massachusetts and even in another country. My office in Mashpee is conveniently located to serve Barnstable County and Cape Cod & Islands’ towns. Call me at 508.269.0109 to discuss my services and how I may be able to help you. You can read an interview I did for a hypnotherapy practitioner’s company at their website here >>>. This interview will give you some insights into what I love about my work and some of the challenges. I love my work and want you to enjoy your hypnosis experience. You’ll find our sessions together relaxing and informative, and conducted in a fun atmosphere whether you elect to visit my office or experience hypnosis online. I offer both private and group sessions. My Private Quit Smoking and Weight Loss Programs are customized to address specific issues for a client. Group sessions are naturally more generic but accommodate those on a budget. Starting in 2017 I am offering my Group Weight Loss program online in a webinar format. When I’m not seeing clients I enjoy reading, volunteering my time participating in local radio programs at Audio Journal, and acting in their plays where the trapped thespian in me can break free. Audio Journal is a radio station for the visually impaired and covers the communities in the Worcester region. 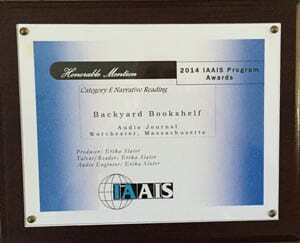 My most recent project is reading books with a regional flavor for a weekly radio segment called Backyard Bookshelf. This year I was surprised to get an award for my contribution, and while I don’t do volunteering for awards – it’s always nice to get recognition for something you love doing. 1. I went to school with the little girl in Mary Poppins. 2. I experienced the amazing feeling of floating in the Dead Sea. 3. I once worked as a housekeeper for a prince and princess. If you’ve been focused on finding just the right person to help you then its probably no mistake you’ve reading this today. If you feel like I’m somebody you’d like to take the next step with then I look forward to talking with you about my hypnosis services. You can contact me at the phone number below or complete my web contact form here or get more details about my services here >>>.